Alaska - In 2009 I was working for the Bonneville Hotshots, a wildland firefighting crew based out of Salt Lake City, Utah. 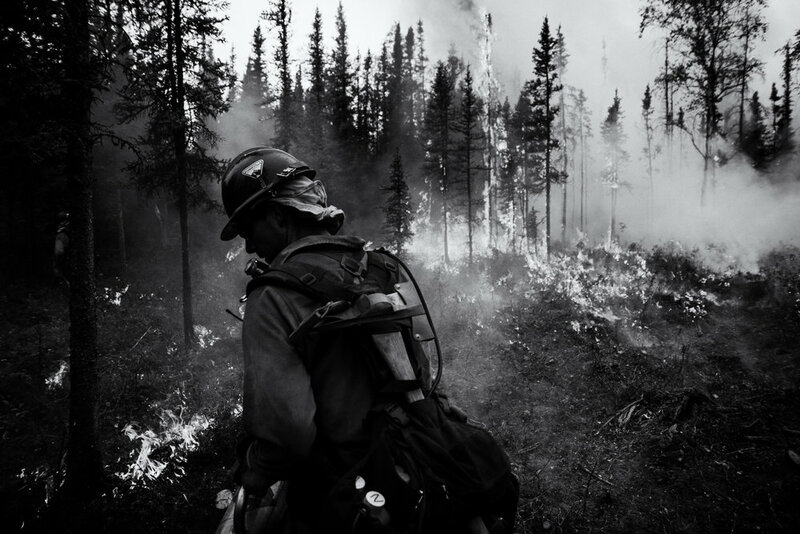 At the beginning of the season, we flew up to Alaska to help fight a massive wild fire raging out of control. After flying in to Fairbanks and jumping on a chartered bus, we arrived at the helibase and flew in to the fire on helicopters. Flying in low over the timber, we landed near a marsh. On the second load, the helicopter ended up landing in the middle of the marsh, It's tail rotor sinking dangerously close to the ground. The pilot knew the danger and ordered everyone out. I watched as the crewmembers jumped out of the helicopter into waist deep water, wading toward dry land, holding their bags above their heads like they were in Vietnam. For two weeks, we worked 18 hour days, cutting line, and securing the edge of the fire. Toward the end of our tour, we were assigned to burn out a section of line. For this particular assignment, my saw team, along with two other saw teams and a handful of diggers, were assigned to the hold the line, meaning we were going to spread out and make sure that our burnout operation didn't jump the line. We were positioned so that if it did cross, a handful of us could jump on it before it got out of control. As the burners staggered down the line, igniting the undergrowth, we crossed our fingers and prayed for good wind. They passed us with glazed looks on their faces, a result of the insane work schedule we all had for the last two weeks. Zach Henseler, a lead firefighter at the time, paused to check out his work as he moved by me. On our way home after our tour, we found out that the fire had blown up and destroyed all the work that we had just put in. Such is the life of a Hotshot.